Who’s Gonna Win the Other Statewide Races? For a few weeks, we’ve been asking Colorado Pols readers to project the eventual winner of the race for Governor. We’ll ask again next week, but today we want to dive into the other big statewide races. As always, we want to know who you think will be the winner in these races, not who you support or who you would prefer to see emerge victorious. The point of this exercise is to track how perceptions of each race are (or are not) changing as Election Day nears. Who Will Be the Next Attorney General of Colorado? 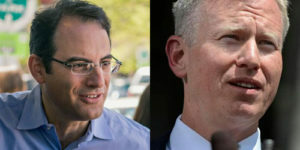 Who Will Be the Next State Treasurer in Colorado? 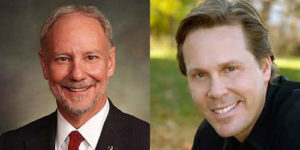 Who Will Be the Next Secretary of State in Colorado? If Polis does win in an unenthusiastic walk against Stumbleton Stapleton then many independent voters will be looking down ballot for someone to "balance" things. Right now Wayne Williams seems like the most likely to benefit from this. I think that what Phil Weiser has going for him is that his opponent has name recognition and a lot publicity. But not very publicity. If you do a word association test and mention Brauchler's name, I would venture to guess that three-quarters of the people who recognize his name instantly think of James Holmes. And a good number will think of his less-than-stellar gubernatorial race. People at RMGO may think about the Red Flag bill he supported. Before he didn’t. And a handful – mostly people in – will also visualize the Shirtless Sheriff upon hearing Broccoli's name. Weiser also has a very well organized campaign for an office where the issues like judicial and sentencing reform are a bit more Democratic leaning in this cycle. I voted Watson in the poll because I agree with the Big Line that is is a 50-50 thing right now and I knew a lot of Dem loyalists would be voting D out of enthusiasm. The thing that could blow my skepticism away is if, in the fall, the blue wave stuff gets Democrats more fired up than I think Polis is capable of doing. Then Democrats could sweep the statewide races. And now a dose of reality: every election Democrats think they have a shot at these offices, and every election you lose. Face it Pols, these are like Coffman. You'll never win. Can we mark your words? How many bathroom breaks do you take to rail against the government you work for MAGAt? Using that logic Democrats/liberals could say the same of the Governorship. Republicans have lost three races in a row while thinking they had a shot therefore they will always lose and should give up. In reality the only of these offices consistently held by Republicans is Secretary of State. All the rest of them have switched party control by election in the last 20 years. Moddy doesn't believe elections are legitimate unless Republicans win. He wants the same kind of elections Putin has. He wants the kind of elections that Putin's Apprentice can win and then when the balance of power shifts, they will demand that the rights of the minority are of primary importance. They've actually lost nine out of the last eleven gubernatorial races, but who is counting? …these are like Coffman. You'll never win. Moddy, are you happy with Trump putting the kibosh on your COLA raise? …and there he was, all set to graduate from Dollar General kleenex to Puff's Plus Lotion. Bummer. Maybe next budget cycle? When the grown-ups are back in charge of the budget in the lower chamber? We've almost single-handedly killed irony engaging with Nutter on any topic. Do voters ever know these candidates, even the incumbents? Seems like it all depends on which way the wind is blowing, thus this year the D candidates will likely win. We really need to make AG and Treasurer appointed positions. Secretary of State could be chosen by county clerks to just run the elections; turn all the rest of the clerking over to the Dept of Revenue or some other state agency. Electing an Auditor (like in Missouri) would make more sense. Of course we can "know" the candidates – by their votes and deeds if they are incumbents, by the corporations and groups who donate to them if they are candidates, in person at town halls, meet and greets, conventions, and to a lesser extent, by their published words in the media and on their websites. I kind of like the idea of having Clerks choose a secretary of state for elections; however, in Colorado, we're constitutionally stuck with someone who oversees charities, businesses, and elections. That's unlikely to change. Jena Griswold is smart and tough. I've met her on several occasions, when she made the trek to talk with our northeast Colorado Dems. She will be an excellent Secretary of State. Phil Weiser was not my choice for AG; however, he seems to be honest and competent, and will make decisions in line with the progressive directions Colorado favors. Brauchler is the opposite in every way, judging by his deeds. Do you think that it would be harder to change the definition and roles of these positions than other potential constitutional amendments? I think it is probably politically doable to move the business registration, charity oversight, administering the Uniform Commercial Code in Colorado, licensing notaries, and certifying gaming managers functions to a department that headed by an appointed by the governor with "advice and consent" of the legislature. Colorado Department of Commerce? Or to go the other way and split off the election oversight function to a non-partisan manager. Maybe one who needs the confidence of a larger portion of the legislature. I agree with @flatiron that Treasurer could easily be an appointed position. Or eliminate Lt. Governor and have the Treasurer run as part of the Governor's ticket. Yes…I actually think you'd get more pushback from the business community if you tried to separate the elections and business functions of the Sec State. It’s designed to fund elections from business fees, too….so if the two were separated, how would elections be funded? That would be a huge budget item. IIRC, Independence Institute and other right wing groups have been pushing this idea for years – they’d like for elections to be defunded. Gessler, Williams, Mike Coffman, Buescher…they all to a certain extent have curried favor with businesses by offering fee holidays, special favors for political "non-profits", etc. They've overlooked those conflicts of interest and used the office for partisan purposes. Then when their budgets become strained by all of the freebies, they cry "I'm broke" when they have to do something expensive for elections, like check signatures carefully. I don't think that the solution would be to have the Governor appoint a Sec State, either – it would still be partisan. If an initiative was made to amend the Constitution to separate elections from business oversight, most consumers wouldn't care one way or another, but the businesses and corporations would lobby fiercely against it. The last thing they'd want is to lose their buddy in the Sec State's office.